National Park Service Lands include National Parks, National Monuments, and National Preserves. These lands typically charge entry fees, and they tend to have much stricter regulations than other federal lands. Camping is allowed only in established campsites. National Forest Service Lands include the National Forests and National Grasslands. Both usually allow free access, and some allow free camping, but some restrict camping to established campsites which charge a fee. Wilderness Areas are among the most highly regulated and strongly protected public lands. They are typically roadless areas accessible only on foot. Camping requires a permit. Bureau of Land Management (BLM) Lands are, generally speaking, the least regulated federal lands. Access and camping are usually free. Much of the BLM land in Colorado is characterized by sagebrush. The US Fish and Wildlife Service administers Colorado's National Wildlife Refuges. Access to most NWRs is limited to refuge auto tour loops. Some are seasonally closed. Colorado State Parks charge fees for entry and camping. An annual pass can be purchased from manned park entrances or ordered online. State Wildlife Areas (SWAs) are small areas set aside by the Colorado Division of Wildlife for game management purposes. Several SWAs are closed for part of the year to protect wildlife, while others are do not permit any public access. Some SWAs offer free camping sites, some charge for camping, and some do not allow camping at all. Entry to all SWAs requires the purchase of a Habitat Stamp. Habitat Stamps cost $5 with the purchase of a hunting or fishing license, or $10 by themselves; they can be purchased anywhere hunting or fishing licenses are sold, or by calling 1-800-244-5613, or online through the DOW website. The habitat stamp provides access to all State Wildlife Areas for a year. The Colorado State Land Board administers Colorado's State Trust Lands. About one-sixth of Colorado's state lands are leased part-time by the Division of Wildlife to provide public access for certain types of wildlife recreation, including birding. However, access is usually seasonal and often highly restricted. The DOW maintains a list of properties currently open along with directions and regulations, which is available online from their State Trust Lands webpage. Open Space is put aside by Metro-area counties and cities as parkland. These properties usually charge no entrance fees. Some are not open to the public. The City and County of Denver owns and operates the Denver Mountain Parks, which include some of the better birding areas in the foothills west of Denver. All these parks are open to the public, but some are completely surrounded by private property. Only one (Genessee Park) allows camping. Other publicly accessible lands include city and county parks and wildlife easements. For more information, visit BLM Colorado's page about access to Colorado public lands. 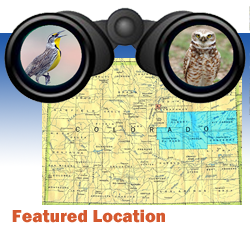 Birders should be aware that the Roads of Colorado atlas and newer versions of the DeLorme atlas both show boundaries between public and private lands that can occasionally be misleading, since not all public lands are open to the public. For example, the “State School Board Lands” (see State Trust Lands above) are often visible on the atlases as little rectangular “islands” of public land in a sea of private property. The problem with seeking out these parcels for birding purposes is that most of them are leased out to farmers or ranchers for their operations, and the lessees have the right to prohibit public access. The same situation can occur on other state lands, of any size and shape, anywhere in Colorado. Another problem is that the atlases do not necessarily reflect recent changes in land ownership. Land swaps and sales occur frequently, particularly on state lands and BLM lands, so even if the land was public yesterday, it may not be public today. Fences and signs on the ground trump the information in your atlas. Please keep this in mind when birding the backroads. It is quite common for birders driving rural public roads in Coloradoto find themselves confronted by a barbed-wire gate or a fenceline posted "private property". Usually, in these circumstances, the road is public and the rest of the land is private. It is acceptable to open these gates and bird from these roads, as long as you stay on the road. If you do open a gate, ranch etiquette demands that you close it once you are through. Some roads in rural Colorado are private, in which case it is not okay to open gates or bird the roads. Use good judgment to tell the difference. In general, named roads are okay if not posted private.